It was an early Saturday morning in mid-May at the Bernardo Wildlife Management Area (WMA) south of Albuquerque. 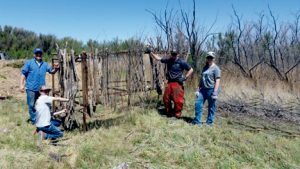 New Mexico Department of Game and Fish staff from the wildlife management and field operations divisions were already hard at work preparing tools and equipment. Eight ambitious volunteers signed up for a workday on Bernardo and La Joya WMAs to help improve hunter access. Opportunity soon joined them. Last year, the number of migratory bird hunters who obtained a Harvest Information Program (HIP) number increased by almost nine percent, from 42,764 in 2016 to 46,555 in 2017, according to department statistics. To ensure that these numbers continue rising—and that interested hunters find quality waterfowl hunting opportunities—the department is planning major improvements on these WMAs. Staff have already begun securing water rights, engineering wetland improvements and building partnerships to ensure success across the state. Top: Wetlands on La Joya Wildlife Management Area. Left: Staff and volunteers assemble a youth hunting blind on Bernardo Wildlife Management Area. 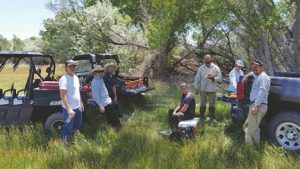 Right: Staff and volunteers enjoy a well-deserved lunch break during a volunteer workday on Bernardo and La Joya WMAs. Lunch was generously provided by partner organization First In the Field. Department photos by Ryan Darr. WMAs targeted for wetland improvements over the next five years include: W.S. Huey WMA (Eddy County), La Joya and Bernardo WMAs (Socorro County), Jackson Lake WMA (San Juan County), Tucumcari Lake WMA (Quay County) and McAllister Lake WMA (San Miguel County). Enhance water-delivery systems and wetland infrastructure to maximize water efficiency. Removal of invasive species such as salt cedar from wetlands and restore with native plants to improve wetland habitat. Incorporate public access for hunting and outdoor recreation into all design improvements. Including new roads, parking areas, access trails and wetland designs more conducive to safe and enjoyable hunting and wildlife viewing experience. The volunteers were able to install and camouflage youth hunting blinds on Bernardo WMA as well as clear and mark new access trails on La Joya WMA. Department staff and additional volunteers followed up these efforts by installing new parking areas and signage to improve access and opportunity for the 2018-2019 hunting season. Interested hunters can visit the department website wildlife.state.nm.us for updated access maps for La Joya WMA. 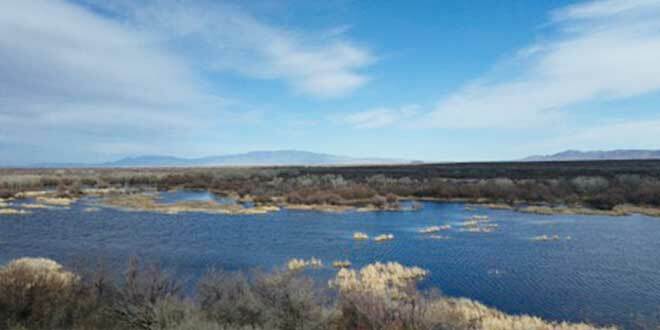 Darr noted that, in addition to these improvements for the upcoming season, the department is looking forward to the major wetland and waterfowl hunting improvements and the benefits they will provide for wildlife, hunters, and outdoor recreation across New Mexico.